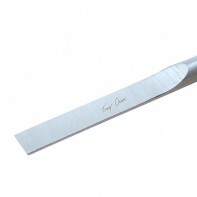 Unlike regular scrapers the Tracy Owen Fine Finishing Tools are made from round bar HSS steel giving the tool a round bottom to place on the tool rest making shear scraping very easy with positive control. 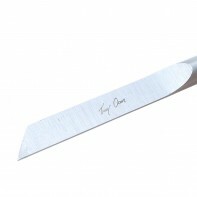 Turn the tool to an angle of about 45° when presenting it to the work to ensure a cutting action rather than scraping. 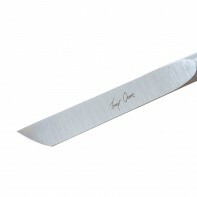 Shear scraping should be performed delicately with a minimum of pressure. Shear scraping is the ideal solution when making final fine adjustments to the shape of the work piece and will leave a finish requiring very little sanding. Tracy Owen is one of the UK’s leading wood turners, he is well known for his articles in the Woodturning magazine and for his demonstrations up and down the country. 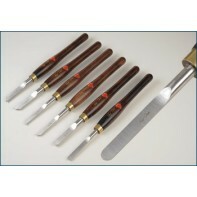 Tracy developed this range of shear scraping finishing tools, manufactured by Henry Taylor’s craftsmen who have many years of experience in hand tool manufacturing.